Follow the steps below to join Knowledge Club and become a member today! Becoming a Knowledge Club Member ensures you a set of extra benefits; from up-to 60% discounts on the KC seminars and workshops and exclusive discounts on all other events throughout the year. Member can select any seminar or workshop to attend. Member must register 2 weeks before the event date. 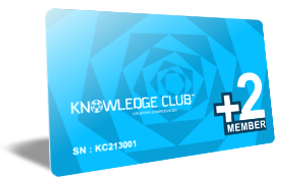 This Membership card is valid just for the Knowledge Club 2017. This Membership card can be used by different delegates. يجب ان يتم التسجيل قبل تاريخ المحاضرات او ورش العمل بإسبوعين كحد أقصى. العضوية صالحة لـ Knowledge Club 2017 فقط. يمكن لأعضاء Knowledge Club تفويض بطاقة العضوية لمنتدبين آخرين. رسوم العضوية غير قابلة للإسترداد.